Through our Digital Transformation Initiative (DTI), we help our Members understand the challenges and opportunities of the information age, and support them through their own change processes. The impact of digital technology on society has fundamentally altered the expectations, interactions, and consumption patterns of our audiences. As a result, public service media (PSM) must engage in fundamental transformation if they are to remain relevant in this increasingly competitive and constantly changing environment. The DTI aims to help Members understand and implement the process of restructuring and transforming their organizations. Every Member faces different challenges and opportunities, which is why the DTI draws together expertise from across the EBU to address your needs from a multidisciplinary perspective. We provide expertise, knowledge exchange, and tailored support services. Establish a common framework and terminology to address digital transformation for PSM. Support Members understand their digital maturity and capabilities for positive change. Provide services, strategies and recommendations that address digital transformation needs. Create a hub of digital transformation knowledge. Contact us to discuss how we can help you today. Sign up for our EBU Digital Transformation Updates to receive a monthly newsletter in your inbox. A huge amount has been written about digital transformation, but PSM operate within a different frame of reference from most industries. PSM are focused on citizens over customers, social rather than business value, universality before markets, and impact over revenue. For PSM, digital transformation means adopting processes and practices that ensure they can compete, thrive and survive in a digitized world. Implementing new technologies is just a one part of this, with questions of cultural change, organisational structure, strategy, talent management, and leadership being equally important to the wider transformation equation. It is also an ongoing process, and a truly robust organisation must have the capacity to continually evolve. In close collaboration with Members, we have developed a conceptual framework for digital transformation, tailored to the unique challenges faced by PSM. We have identified five top-level goals and nine transformation enablers that are key to the PSM role and circumstances of PSM. We have also developed a number of tools for self-assessment, prioritization and measurement to help Members in their internal discussions and strategic planning. 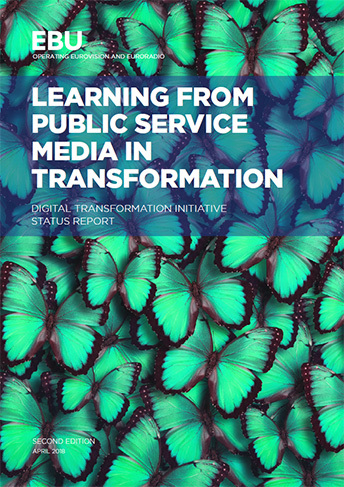 Access the framework and tools and find out how different EBU Members are currently tackling these challenges in our report, "Learning from Public Service Media in Transformation". Our network has over 200 experts from across our Membership who are actively engaged in the transformation of their organizations, whether it is at the strategic boardroom level, or more ‘on the shop floor’, working on design, innovation and content creation. We invite your customized requests to connect you with your peers on the issues that you want to talk about. We will then identify the most significant members of the community and facilitate a conversation in the form that best suits you, and see where it leads. In addition, our workshop series brings together Members for the exchange of practical experiences and insights on common thematic issues. This is an ongoing project that illustrates the framework for digital transformation through practical, real-world examples and critical analysis. The EBU has a dedicated team to support you with your digital transformation. We also draw from the expertise of all EBU departments and our peer network in delivering our tailored services. Support is planned according to feasibility, capacity and the resource requirements of the request.